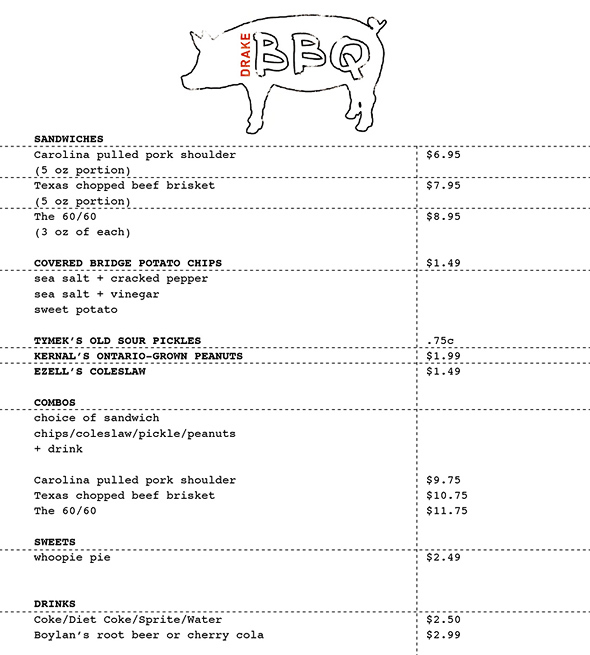 The Drake is switching from ice cream to BBQ. Drake BBQ is set to open October 22 just east of the hotel (at what was formerly Drake Scoops + Tees) to satisfy those midnight cravings for...beef brisket and sour pickles. The menu offers three main dishes; Carolina Pulled Pork Shoulder ($6.95), Texas Chopped Beef Brisket ($7.95) and the 60/60, which includes three ounces of each ($8.95). Also on the menu are sour pickles, Ontario-grown peanuts, Covered Bridge potato chips from New Brunswick and retro glass bottles of Coke. The dĂŠcor will include a wall of hot sauces and Drake rubs, a chalkboard menu, a wall of wooden tea crates and a "rustic" eat-in counter. Because nothing says "hoedown" like West Queen West. Drake BBQ will open Thursday through Saturday from 6 p.m. "until the beef runs out."